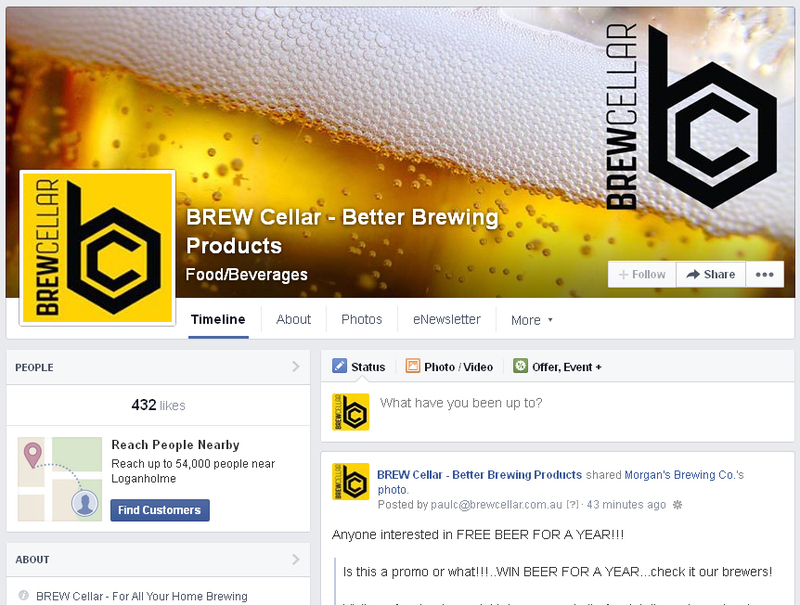 The Brew Guru page has moved to facebook. Hello, Mr or Mrs Guru, Firstly thank you for creating this forum and indulging this amature brewers ramblings. I have been brewing for about three years now, and have a little recipe thats been a real hit with myself and my friends, except in the respect of head quality. It is simply a Morgans Royal Oak Amber Ale 1.7 kg kit with a Morgans Caramalt Master Malt 1.5kg and nothing more. I ferment at 24 degrees (very stable control using a submersible fish tank heater in the carboy) then bottle and secondary ferment in styrofoam boxes on top of a water bed heating pad (also thermostatically controlled at 24 degrees) then condition for 3 months in a cuboard which usually sits at about 5 to 10 degrees. The resulting brew is as i said always a hit and reminicent of a Chimay Rouge, but to finally get to my problem, for a darker thicker beer, it holds only a very thin head where as i belive it would benifit from a thicker creamier head. Do you think the problem is the higher ferment temperature (which i find adds a nice sharpness to to the beer without the need for excessive hops) or a water quality problem (generally just being tap water, boiled to try to remove chlorine) or will this style of beer just not accept a finer gassing? I have also considered a slightly larger than normal amount of priming sugar, but using glass bottles i am wary of this (currently i prime with dextrose as i have found it gives a slightly finer gas). I have also ruled out my cleaning/sterilizing procedures by many experiments. Thank you again for taking the time to ponder my dilema, any advice you can give would be greatly appreciated and i look forward to your reply. Also feel free to pinch this recipe or give it a go, for such a simple idea results are fantastic, and can be made in a more hopped version by using a Morgans Blue Mountains Lager with a safale lager yeast and low temp ferment. Anyway, A final thanks and goodbye. GÃ¢â‚¬â„¢day Russell, itÃ¢â‚¬â„¢s great to hear that you are enjoying your brewing! Your submission raises a number of points, which I shall attempt to address in order. Finally, I shall answer your question, Ã¢â‚¬Å“How to improve head retentionÃ¢â‚¬Â. We do not recommend immersing anything into the brew, including fish tank heaters, as this increases the risk of spoilage. If you must heat the brew, use an external heating source such as a heat-belt or heat-pad (placed beside the fermenter not directly under it). In most cases, a brew only needs to be insulated to keep the temperature at or above 18C. You donÃ¢â‚¬â„¢t mention how long the bottles sit during secondary fermentation. ItÃ¢â‚¬â„¢s a good idea to leave them for at least 14 days. The conditioning temperature is a bit low for secondary fermented ale. Look to get the temperature up to at least 16C. If your brew reminds you of a Chimay (you also mention a Ã¢â‚¬Å“sharpnessÃ¢â‚¬Â), you may be detecting flavours/aromas caused by organisms other than the ale yeast supplied. Dextrose (or Dextrose Monohydrate) has some of its weight made up with water molecules and will not produce as much CO2 gas as the equivalent weight of white sugar. Prime with white sugar at the rate of 8g per litre or 9 to10 g per litre if using dextrose. Make sure to rinse all residual detergents out of the fermenter. Increase the amount of hop bitterness in the brew. Make sure to prime at the recommended rate. Extend the conditioning period of the beer (a brew at 12mths shows better head retention that at 3 mths). Serve the beer in clean glassware at 4C or less. right once and for all!!! what is the best temperature to lager at? same as fermentation? (i.e 12 degrees) or below 4 degrees? Hello bre guru, i would love some advice on how to brew genuine quality lagers. I have been brewing for about two years and i find that while my pale and amber ales are fantastic, my lagers are a bit hit and miss. I have a temperature controlled fridge which i set at 12 degrees to ferment my lagers, and of late i have been turning it up to 20 degrees when fermentation is close to finished in order to give my lagers a diacetyl rest. But where i get confused is in relation to what temperature to mature or “lager” my beers at. My understanding is that commercial breweries chill the beer to at or below 4 degrees after fermentation is complete, and in fact this is where the term “lager” comes from as the germans would leave the beer to mature in very cold caves during winter and lager literally translates as cold storage. One of my local home brew shops recommends this method, after the diacetyl rest syphon into an intermediate vessell and chill below 4 degrees for about 4 weeks before kegging or bottling. But another home brew shop i like to visit is totally adamant that you must mature your beer at the same temperature that you ferment at, so for lagers that is 12 degrees, and that by chilling the beer below the range that the yeast will remain active you are preventing maturation from taking place at all. This advice has certainly worked for my ales, if i ferment and mature at about 20 degrees i almost always end up with a nice ale, but all the research i have done on lager brewing suggests that maturation of lagers occurs at near freezing temperatures. And i have recently purchased a beer filter system, and i am curious as to whether this will improve my kegged lagers or not. Could you please tell me what is true and what is false and give me any other advice you think might help. Thanking you in advance!!! 4.	minimise aeration of the brew when transferring. How much water to add to the Brew Cellar recipes? I am unsure on how much water to add to the Little Creatures Pale Ale Recipe kit that I bought yesterday. G’day Mick, All recipes in the “BREW Cellar Recipes Series One” brochure are formulated as 23 litre brews. I have two points in response to your most recent post. 1. I think your re-hydration temp of 12C is too low. From the Fermentis site – Fermentis recommends that top fermenting/ale yeasts are rehydrated at a temperature between 25-29Ã‚Â°C (77-84Ã‚Â°F) and that bottom fermenting/lager yeasts are rehydrated at a temperature range between 21-25Ã‚Â°C (69-77Ã‚Â°F). 2. You are not pitching massive amounts of yeast so I would like to see you start the brew at 22C-24C then drop it to his preferred ferment temp after 12hrs have elapsed. This technique will, hopefully, increase the amount of healthy yeast cells available to ferment the brew. In turn giving cleaner flavour and aroma. I am interested in moving onto a keg system and the 12 litre would fit nicley in the fridge i have. Can the keg charger with the co2 bulb be enough to carbonate the beer or do i need the regulator and co2 gas bottle to achieve this. If force carbonating, you will go through a number of CO2 bulbs in order to put enough fizz into the beer. This could become an expensive exercise and a regulator plus gas bottle would be a better option. However, you may want to look at secondary fermentation in the keg (adding a little priming sugar). Secondary fermentation should take about 2 weeks. You can then stick the keg in the fridge. After 24 hrs release the head pressure through the pressure relief valve, attach the beer out line and pour beers, then give a squirt of the CO2 bulb from time to time to keep sufficient gas on the headspace and push the beer out of the tap. Using this method, the first 2 or 3 glasses will be a bit cloudy but it will pour bright soon enough. I have purchased the ingredients to the Medieval Honey Chamomile Amber you mentioned in Vol. 4 of the Brew Cellar News – 3.0kg Amber Malt Extract, 150 gms Light Crystal Malt, 0.6 kg Yellow box honey, 30 gms Fuggles Hop pellets, 30 gms Fuggles Hop pellets 125 gms French Oak Chips, 9 x Chamomile Tea bags 2 x MorganÃ¢â‚¬â„¢s Premium Ale Yeast. The one thing I am missing is the detail around the method Ã¢â‚¬â€œ you mention the boiling in 20lt and adding certain ingredients at certain times but this will mean that there will be quite a bit of material in the beer Ã¢â‚¬â€œ do I need to strain it or when boiling have the Oak Chips etc.. in some sort of wire Ã¢â‚¬Å“tea bagÃ¢â‚¬Â? Also can I boil all of in a say 10lt than add it to the remaining 10lt? Just need some more detail around the method please Ã¢â‚¬â€œ hope you can help? you seem to know more about DRY ENZYMES than anyone in my brew world. so , how much of the sugars do they break down? do they break down maltodextrin? do they break all of the carbs in light dry malt? if i made an average kit with 500grams of LDM and a dry enzyme could you give me an idea of how many carbs per 100ml? Ã¢â‚¬Å“I have to admit, although it’s a very interesting recipe, I have not made this brew. As the recipe stands, not only will there be quite a lot of material but there will be a very large volume of wort that requires cooling quickly to yeast pitching temperature. At the risk of making a whatsit out of U and ME, I will assume that you, like most home brewers, do not have the equipment to cope with cooling a large volume of wort quickly. 3. Add the tea bags then remove from the heat and leave to steep with the lid on for about an hour. 4. Meantime, pour 1 litre of boiling water over the oak chips, stir for a bit then cover and leave to steep. 5. Strain the (honey/fuggles/crystal malt/chamomile) stew into the fermenting tub, add the amber malt and stir to dissolve. 6. Add the oak chip tea, oak chips and all. Top up with cool water (might be a good idea to have 5 litres fridge cold) to the 20 litre mark. 7. Stir vigorously then sprinkle on the yeast and ferment as normal. Enzyme (in dry or liquid form) will continue to work on all carbohydrate material within the brew, breaking it down into simple sugars for the yeast to metabolise. The more complex the carbohydrates, the longer the process takes. We homebrewers do not have the ability to stop enzymatic activity Ã¢â‚¬â€œ this requires pasteurising the finished beer, which also kills the yeast and prevents secondary fermentation. For this reason, when using enzyme in the brew, I urge you to use PET bottles or kegs (with a pressure relief valve) rather than glass. The use of maltodextrin and enzyme in the same brew is contradictory – maltodextrin gives more body to the brew while enzyme is used to reduce the body. Enzyme should break down the complex sugars in the Beer Kit and the Light Dry Malt, leaving as little as 1g of carbohydrate per 100ml, rough guess! Make sure to allow a few days longer for fermentation to finish, stable SG readings over 3 days (I normally say 2), to be sure. i dont use them anymore, but friends n relo’s do! ill let them know, it was frustrating me that question! wort. Would it effect my brew? Assuming 250g of Dextrose is added to a 23ltr brew, it will increase the alcohol by about 0.5% and thin the brew a smidge. G’Day Guru Can you tell me what is the lowest temp Brew Cellar European Lager Yeast will work at. Will it perform at 7 c or is that too cold? Now I know it will not effect my brew, I’ll give it a go next brew and see how it goes. RE: Yeast temp…I recommend European Lager yeast to ferment in the range of 12C Ã¢â‚¬â€œ 15C. It will ferment at a lower temperature but no lower than 9C. At 7C, there is a good chance that it will fall out of suspension. I have tried and enjoyed some of your recipes, but what I’d really like to get close to is a Hofbrau Original. Any Pointers? I recently started brewing my 3rd home brew, this time I used the Coopers European Lager. It was only once I had a proper look at the can/brew kit that I noticed it recommended to keep the brew in the bottles for 12 weeks. That means I won’t be drinking my brew til late July/early August! Is this right or is that a really cautious recommendation by Coopers? They also say to not use white sugar with European Lager, right/wrong? I havenÃ¢â‚¬â„¢t analysed or tasted this beer. There is a good chance that itÃ¢â‚¬â„¢s of similar style to most Ã¢â‚¬Å“green bottle lagersÃ¢â‚¬Â. So, the Becks recipe (BREW Cellar Beer Recipes Ã¢â‚¬â€œ Series One) might be a good start. ItÃ¢â‚¬â„¢s a good idea to follow the manufacturerÃ¢â‚¬â„¢s instructions/recommendations when making up a beer kit for the first time. Once made and evaluated, decide for yourself whether to modify the recipe for next time. Any deviation from the instructions – including sugar additions, ferment temperature and conditioning time – is likely to move the final beer away from the intended style. I have just started brewing with the recipes and my beer comes out with a greenish colour and it has a strong hops tast. How can I make a beutiful bronze looking beer with the tast to match? Perhaps you could try reducing the amount of hops added. What is the recipe, exactly? Do you have a particular commercial beer in mind? I’ve been trying Toohey Extra dry with the seperate ingredients. The hops I have been using is the Brew Cellar 12g cluster infused bag, and I put that in a mug of boiled water for about 10 minuts. It will look bronze for 20-24 hours then it goes greenish untill I bottle it. Just wondering on some tips on gassing a 50l cub keg. Have been having trouble in the past. What pressures and for how long while gassing? . What pressure do i need for pouring?. Do i leave gas on a certain pressure while not in use. Does anything change as the keg gets emptier? I use 2m of 5mm beer line and run fridge at about 3 degrees. Any tips would be greatly appreciated. I have one of your standard 23 litre home brew kits and in these colder months i am wondering about keep the brews warm [cheaply]. You can’t go past the BREW Cellar heat pad or heat belt. I use them myself and they are brilliant. Your local BREW Cellar stockist has them. It’s simply a matter of doubling the recipe. Make 46 litre brews in a 60 litre fermenting vessel. I have been given some native bee honey and i would like to make a honey beer with it. The honey is a darkish amber colour and has mango aroma and slight mango taste. Can you please give me some direction as to how i can go about using it in my brew as i have never done this before. Which starter kit did you get? The BREW Cellar starter kit has excellent instructions. I would be happy to help you however so send an email to the BREW Cellar team and we will send you some further instructions. Try using about 350g in a brew. This equates to about 250g of sugar – it should ferment in a similar way to malt extract. To be safe, mix with 1 litre of water and heat it up just short of boiling. This will sterilise the honey. Then add it to the FV. If you are able to control temperature, go for the lower end of the recommended fermenting range. Large changes in temperature can adversely affect your brew but donÃ¢â‚¬â„¢t be too concerned with a 4 degree swing. Enzyme breaks down more complex carbohydrate into simple sugars, allowing the yeast to fermenting the brew more thoroughly, FG of 1002 or less. We have a BREW Cellar brand enzyme. However, Tooheys Extra Dry is not a low carbohydrate beer. i live in Bali and am over Bintang. For argument sake i think it would be a similar climate to CAirns or Broome. What would be some good home brews to get going up here and any other pointers to make a good brew? i currently ferment in an aircon’ed room at about 24 degrees. I could do it outside but that would be at about 29 degrees. thanks any advice is appreciated. At 24C any brew with ale yeast will be fine. Tell me what style off beer would you like to make and I will suggest some recipes. My next batch i am trying is coopers but a carona recipe would be great. i did my first batch last week and it was one of the tooheys new kits – now realise lager probably not the best choice for hot environment. ready for bottling on saturday so fingers crossed. Follow this link to our recipe page – there is a Corona recipe listed here. Also if you like a Mexican Cerveza style, try the Morgan’s Chairman’s Mex Cerv – with a hint of lime already in the can it is a really great brew. Brew cellar premium yeasts use by dates.
? should there be a seperate use by sticker on these yeasts ? with great success, however have a 12+ hour apparent lag phase with this one. Follow the instructions on your can and add the Body Blend #10 instead of your normal dextrose or sugar. So if you would normally put 1kg of dextrose in, put the Body Blend instead. I have two brews on at the moment (now for 16days) and they have both started well with good bubble for four days and stopped at about 1018. One is a Morgans Blue Mountain with Liquid Lite Malt and the other your Golden Ale recipe. I have them in the garage and at the moment the temp is between 9-16 degrees. I have considered heating, bottleing, and add a new yeast? Hi Guru when sterilising the stubbies prior to bottling can you do it the day before or should it be done just before you bottle and allow them to drain slightly and pour immediately. If you use a product such as ‘Morgan’s Sanitize’…all you need to do is use the 30ml/1ltr mix and you are good to go…you don’t even need to rinse! I have a coopers dark ale kit and wondering which coopers malt extract to team it with (ie amber or dark) and also wonder if it would benefit from a brew enhancer suger blend or just dextrose? Try using the BREW Cellar # 15 Ultra Blend with that Coopers dark ale. It will give you a nice creamy head. I had forgotten that i had put a batch down 5 months ago & have just realised it was still in the fermenter. Q Will the brew be affected in any way because of the length of the fermentation, the reading was 1000. It taste a little thin but I havent carbonated it yet. If you are happy with the taste and smell, that is all that matters. There may be very little yeast in suspension for a secondary fermentation to take place but if you plan to force carbonate in a keg it should be fine. I put this down last Wednesday, hot day in Brissy and started at 28C and was hummy away beautifully for a day or so. Now we have struck a cold wet snap and is running at 23C and has all but stopped bubbling (every 3 to 4 minutes). My SG readings are 1020 for the last two days, is this a sign that yeast has gone into a dormant state or is the normal and I should just be patient with it. Ignore the airlock, 23C is more than enough to keep fermentation going but 1020 is a bit high. What was the date code on the BML kit? Give it a few more days and take another SG reading. 1. Bottle into PET bottles, then if they become overpressured it is a simple task to release some gas. 2. Add another yeast sachet, hydrate it in a cup of tepid water for 15 -30mins prior to gently stirring it in. Then leave it for a few more days and check the SG. Got the same reading two days later so bit the bullet and bottle in PET. Been checking them each day and so far so good. Cant remeber what the date was on the BML but I do remember making sure it was still in date and it was fine. I am about to put down another brew, IPA by Coopers, might hydrate the yeast as you say to make sure it gets off to a quick start. I am attempting to improve my lagers by brewing with a European Lager Yeast at about 12 C, then lagering at about 4 C before bottling (not a keg). However the previous attempt resulted in a very flat beer presumably because the yeast was either killed or fell out of suspension so there was negligible secondary fermentation. I have two questions. I have heard general comments that at 12 C and 23 litres, one packet of yeast may not be sufficient? How should I add further yeast near bottling to ensure secondary fermentation is successful? One sachet of yeast should be sufficient to ferment a 23 brew with an OG less than 1.040, but donÃ¢â‚¬â„¢t start it at 12C. If the pitching rate of lager yeast is less than 1g per litre, start the brew at 22C-24C for the first 12 hrs then drop the brew to desired fermentation temperature. Yes, lager yeast is likely to fall out of suspension when the brew sits at 4C. Yeast is required for secondary fermentation in the bottle. So, donÃ¢â‚¬â„¢t bother to lager if you plan to bottle the beer. If you can see some sediment in the bottom of the bottles, there should be sufficient yeast to eventually carbonate the beer. Warm them to +18C then shake to suspend the yeast and allow to rest for another two weeks or so. This process may require repeating to achieve enough fizz in the beer. Are the brewcellar dry yeasts gluten free? Will Cooper’s Wheat Malt extract and European lager be a good match for brewing? Will it need further sugars if I’m looking for an alcohol % around 4.5 / 5? to you simply put is: What can I achieve with these ingredients? Your comments are very much appreciated. I am wanting to make a XXXX Gold brew & have been advised by the seller to use Brew Cellar Premium Lager Yeast (15 Gms) but the the can comes with a Yeast (5 Gms) sachet. Why is there such a difference & which one should we use? Also is the 12g Cluster necessary? I wish to make a 3.5% A/C beer. I am, sadly, a lapsed home brewer as when I moved house, there was nowhere the temperature was consistent enough. I now want to start again as, 1 I hate paying nearly $50 for only reasonable beer and 2 because I used to enjoy it. My question is: I don’t have anywhere where the temperature is consistent so I plan to try to control the temperature. I have read many articles about fridge controllers, but have not been able to find a definitive answer as to whether you need a heat pad in a fridge along with the thermostat gizmo or whether the thermostat by itself will control the temperature sufficiently. It strikes me that using a heat pad/fridge combination would not be eco friendly as they would be competing with each other and chewing through the electricity, but a thermostat by itself would be realtively cost effective. I would be grateful for any advice you can give. Re: Are the brewcellar dry yeasts gluten free? Our BREW Cellar XXXX Gold recipe recommends fermenting at 12-18C with 15g BREWCellar Premium Lager yeast. to the recipe if the beer does not meet your expectations. Yes, European Lager plus 1.5kg of Thomas Coopers Wheat Malt to 23 litres will produce a beer around 4.8%ABV. You might like to add some late hop such as hersbrucker or hallertau. I am new to the art of brewing beer. I have achieved mixed results…. Thanks for the tip and advice. I will start doing the Grain adding advice with my next light Ale as a base and change as a new brew is put down. Will be in touch to advice success or failure. I am making a batch T.Coopers Irish Stout 1.7kg can. I added 300gm Dextrose, 500gm Dark Dry Malt, 200gm Blackstrap Molases, 10ml Licorice, the supplied yeast and made the final volume up to 20ltrs (not 23ltrs). Day1=28C temp, 1.042 OG; Day2=32C, 1.014 SG; Day3=26C, 1.012SG; Day4=22C, 1.012SG. Is there a way of approximating what the Final Gravity should be based on the ingredients? I I usually wait 2-3days for a steady Gravity reading before bottling. I have had temp fluctuations due to using a heat pad and local temp fluctuations. Has this brew fermented too quickly? Wow Garry! The fermentation temperatures are too high for this style of beer. The yeast will ferment the beer but it may create undesirable aromas and flavours. When you see a recommended temperature range, such as 21-27C, go for the lower end of the range. Final Gravity for this brew may be around the 1010 mark. How much will this reduce the carbs / calories of the beer?? 20% 40% ?? If you scroll up to my response to Matt on March 24, 2010 it should answer your questions. Hi Brew Guru.. On Friday 26/11/2010 I started a brew with 2 x Morgans Ironbark Dark Ale with 1 klg Brew Cellar Body Blend #10. I use a double size fermenter which I have been using for many years and it is in very good condition with seals being replaced regularly enough. I have only ever had one bad brew when I first started and that was because of inexperience (1989). Most of my brews are done with half the brewing sugars recommended because I like the taste but don’t need the alcohol!! It has never failed me even when I have used corn syrup powder alone in the past. It is my second Morgan’s brew, the first being a Royal Amber which I am not too impressed with. I have the same problem as one of your previous writers, i.e., no head retention!! Again first time for me because I haven’t had those problems before. MY PROBLEM at the moment is no bubbling in the airlock after 48 hours.. I have read the Morgans tip and yours. I will endeavour to take a hydrometer reading this evening but I am concerned enough not to venture into a Morgan’s brew again after 2 attempts.. I’ve had better results with other brands. Can you advise what else may be causing this. As said earlier, the fermenter is in good condition and there is no leak anywhere that I can detect with water seals etc. I don’t particularly want to open the fermenter at the moment. I maintain extremely high standards of hygene when brewing and have never lost a bottle in the past. I would appreciate your expert comments. Hi Brew Guru… Me again, John M. Took a reading and doing all its supposed to do, frothy and unclear.. Further inspection and added more water around the housing that holds the air lock… found the leak and sealed with water.. now bubbling well. Should be ok… Smells very nice and if it goes well… I might still use Morgans, depending on result.. Sounds like you have it under control. Please let me know how it turns out. I have just bought a Coopers Mexican Cervasa and I was wondering how could I incorporate a lemon/lime flavour into the fermentation process. I was thinking about cutting a lemon or lime into segments and adding it to the wort??? Morgan’s Ginger Beer contains malt extract therefore we cannot guarantee there is no trace of gluten. It can be made alcoholic or non-alcoholic. Keep in mind however when making a non-alcoholic brew there will be a very small amount of alcohol (approx 0.7% – 0.9%) due to the carbonation process. You can pick up a BREW Cellar micro brewery starter kit and a can of Morgan’s Ginger Beer from your local BREW Cellar stockist and you will have everything you need to get started! Lemon or lime can be added into the fermenting vessel, at around day 3 or 4 of the ferment, by using the zest of the fruit Ã¢â‚¬â€œ start with just one in the first instance. Drop the zest into boiling water then take off the heat and allow to steep for 15 mins or so (this also pasteurises the zest). Then strain into the brew , no need to stir. Ignore the airlock. Take regular readings with your hydrometer and you will know if fermentation is taking place. I have found this forum a good source of info however I am interested in your response to another Peter on 2010.02.26 08:58 regarding secondary fermentation in the keg, then putting the keg in the fridge & using CO2 bulb & a beer out line to pour beer, as this may be a cheaper way for me to move away from the PET bottles without going for a full keg system given the price I have seen some kegs selling for on eBay. Please could you confirm the components I would need (my guess & questions below!) & also what amount & type you meant by a “little priming sugar” for secondary fermenting? Finally I presume I would brew in the normal way then fill the keg from my fermenter & simply add the sugar & stir? Alcohol content may be increased by raising the Original Gravity (a measure of the density of the brew before adding the yeast). 1. Add more fermentable sugars to the brew Ã¢â‚¬â€œ better to add light malt rather than simple sugars such as cane sugar or dextrose. Perhaps start with an extra 500g. 2. Decrease the volume of the brew Ã¢â‚¬â€œ this concentrates the sugars, increasing the density, also increases colour, flavour and bitterness. To start with, go for Ã‚Â¾ the priming rate that you would use for bottles Ã¢â‚¬â€œ this equates to about 6g per litre. You may decide that more or less priming sugar is needed next time. Any good quality steel keg with ball-lock posts will be fine. You could start with our KEGCHA which uses the CO2 bulbs, KEGBUL. Operate the charger from time to time to keep head pressure on the beer Ã¢â‚¬â€œ this prevents it from becoming flat. The keg of beer is pressurised in the first instance through natural secondary fermentation. Ferment the beer then drop it into a clean and sanitised keg with priming sugar. Seal, invert the keg and rock it back and forth to dissolve the sugar and check the seal integrity of the keg. Leave to secondary ferment for at least 2 weeks. When ready to serve, place in the keg in a fridge for at least 24hrs, operate the pressure relief valve, connect the beer line and start pouring beer. The beer will be cloudy with the first few pours but will become more clear as you work through the keg. As the beer flow slows, increase the head pressure by operating the CO2 gas charger. Hi there, do you have any more information on your wheat beer yeast? I would like to know what strains it is similar to, and what is the ideal starter temperature. When brewing ginger beer do you wait till it stops bubbling all together before bottling? I’ve got a brew on at the moment and unlike brewing other beers, where there is a clear and defined, start and stop to the brewing process, the ginger beer started off very gingerly( ha ha), and continues to ferment slowly over a week into brewing. As with beer ingnore the airlock. Bottle once the SG (measured with your hydrometer) has stabilised over 2 days. Hey guru, I’m doing the James squire IPA but instead of a English ale yeast I’m using a us05 yeast. How will this change the brew? The difference is likely to be quite subtle. US-05, when fermented in the recommended temperature range, tends to produce a cleaner tasting beer giving more emphasis to the hop character. If you have any concerns please take it back to the store you purchased it from and discuss it with them. It is difficult to comment without actually seeing it. I have been brewing for many years & have enjoyed many different styles & tastes. My tastes have changed over the years & am currently enjoying Pilsner style but would like to make it more hoppy! I have the ingredients for your recipe using Coopers Pilsener (Pilsener Urquell). Now my question is, should I pitch in all the hops (saaz)at once or add %ages to a simmering brew? I understand that you can get some interesting variations & I am prepared to give it a go! is it possible to make a heat pad for my fermenter? I wouldn’t recommend it when you can purchase one from your local home brew specialty store and you will be getting something that is purpose built for the job. With the Morgan’s/Ellerslie Hop sachets you simply steep in a cup of boiling water for 10 minutes, then pour the whole lot (including the bag) into the fermenter and allow it to ferment with the bag in it. Thanks for your post. Yes It is a good drop. You might also like to try the Morgan’s Chairman’s Mexican Cerveza. Hi guru, i’m still fairly new at home brewing and am looking to get a little creative, and i’m looking for some tips on incorporating either orange or honey into my beer… Any tips or recipes?? I read on a site that honey had to be pasturised among other processes and was quite difficult to successfully incorporate into a home brew, which sort of scared me off a little! Is this true? Honey carries antibacterial properties and does not need to be pasteurised. Treat it in the same way as you would liquid malt extract. When using orange in beer, itÃ¢â‚¬â„¢s the zest that you want. It needs to be pasteurised. Crush coriander seeds, add to Saaz and Orange zest in a pot with about 2 litres of water (just on the boil) and allow to steep for 15-30mins. Strain it into the FV, mix with the other ingredients up to a volume of 23litres. Use the yeast with the beer kit or WB-06. The last wheat beer i tried (which was the morgan’s), gushes continuously for about 10 min or so when opened, so i was not gonna try another one, but i will definitely try this recipe. Do i need to lessen the priming sugar at bottling? Or do you think it hadn’t finished fermenting when it was bottled? Brewguru, Can you tell me please, what are the fermentation temperature ranges for Brewcellar “Premium Lager Yeast” & “European Lager Yeast”? Dan. Fermentation for Brewcellar Lager Yeast is 12-18 degrees Celcius (according to the Brewcellar recipe brochure. Just a quick question regarding the use of carbonation drops for brewing Guinness/Kilkenny styke beer. How many drops should I use if any when bottling the brew. I thinking that using one drop per 740ml should do so that the beer is not too gassy. Brew guru I am pretty new to keg brewing and some times when I start pouring all I get is a jug of froth/ do you have any suggestions?? Guinness and Kilkenny are often served slightly warmer than Australian Draught beer. Many people halve the level of priming sugar for beer intended to be served slightly warmer Ã¢â‚¬â€œ 8C or higher. Note: the creamy head is emphasized by the use of nitrogen, on draught systems and in widget cans. G’day Eddie, Although I don’t have a recipe for that particular beer it might be worth taking a look at our recipe for Grolsch in our recipe section. Hello Brew Guru. I am asking these questions in relations to a dietary requirement. Have you heard of anyone (commercial brew or home brew) who is using Amaranth or Quinoa or Buckwheat grain to make beer? I know that some use rice, millet or sorghum for gluten free beer. Have you come across any recipes using these products? I am looking to put together a Toohey’s Extra Dry for my Daughter’s partner. In the recipe section for local beers the recipe uses Golden Cluster hops. How long is the suggested boiling time for this recipe. right.The larger was lighter.first reading was 1035 at about 24c is this ok.I’ll leave for about 5 days & check on day 5 & 6 to see is reading is same for a few days. Use the Morgan’s/Ellserslie finishing hops – steep in a cup of boiling water as per the instructions. Can you tell me some more info please? Was it force carbonation or natural conditioning? What was the head pressure from your gas bottle? What was the length and diameter of your beer line? Can you tell me the date on the cans? Extract can darken with age and high temps. hi guru how you gong just reading through the last fews years of questions , im doing my first brew today im going to use a keg system im brewing morgan aus larger i bought a package from the local shop brew shop im following the instructions on the can , i live in sydney metro ,ive just used tap water have i just made a mistake, ive done 23lt the first 2 lts hot water put the can in , dex n malt then 21lts cold water in a 35lt fermentor put the yeast bag on top of the lot the put the lid on tight with an air lock ,after say 7 days once ive tested it with the glass thing he gave me i will empty in the keg seal it up in a fridge for a week then carbinate with regulated bottle i got .what do you think really i have know idea just giving it a go. I have been brewing for a while now, and I am just making the switch to a “brewing fridge” (a chest freezer with an electronic temperature control unit). 1. Where a temperature range is given, should I set the temperature to the middle of the range or to the bottom (eg Coopers Heritage Lager advises pitching temperature Ã¢â‚¬Å“22-24Ã‚Â°CÃ¢â‚¬Â, fermenting temperature Ã¢â‚¬Å“20Ã‚Â°C or less / as low as 13Ã‚Â°CÃ¢â‚¬Â, carbonating temperature Ã¢â‚¬Å“at 18Ã‚Â°C or aboveÃ¢â‚¬Â)? 2. If I carbonate in the Ã¢â‚¬Å“brewing fridgeÃ¢â‚¬Â, should I carbonate at 18Ã‚Â°C, or should I carbonate in the same way as the initial ferment for the brew (e.g. for Heritage Lager – 22-24Ã‚Â°C, reducing to 13Ã‚Â°C)? 3. How long should I keep the brew at carbonating temperature? 4. After carbonating, what temperature should I store the brew at? 5. If I want to store the brew in the garage, rather than in the Ã¢â‚¬Å“brewing fridgeÃ¢â‚¬Â, should I give the brew an initial Ã¢â‚¬Å“conditioning periodÃ¢â‚¬Â in the Ã¢â‚¬Å“brewing fridgeÃ¢â‚¬Â before storing at garage room temperature, and for how long? I would be obliged to receive an indication of the range, as well as the ideal, in answer to the above questions. I am also making a shift to kegs (19L Cornelius), but will be using natural carbonation for the kegs, and will continue to use bottles for the un-kegged portion of the brew, and for some brews in their entirety. Does the same advice apply to the kegs as to bottles? G’day, I’m new to brewing. Just a quick question, what happens if my ale brew sits around 20 degrees. Will it still ferment? And at what temperature will the yeast stop working at all? Gday im new to the home brewing i done my second brew and it only bubbled for the first 2 days . Ignore the bubbling airlock. Always use your hydrometer to check your brew gravity. If you get the same hydrometer reading 24 hours apart you know it is finished. I have today begun the journey of home brew and purchased a starter kit today. I am keen (strange I know but it is on medical guidance) to keep alcohol content down as low as possible but still try different types of beers made at home. Is it simply enough to reduce the dextrose etc that I put in or is there more I can do to keep alcohol content down. I would like to try and get below the normal 2.9% where possible. You are on the right track. The less fermentable sugars you have the lower the alcohol will be. Loving this home brew activity and my brew cellar starter kit. Have made 2 great tasting low alcohol beers so far. I want to try the recipe in the Kilkenny style and would like to know if I can reduce the sugar content and keep the alcohol level down but keep the taste similar. Wanting to do a larger type beer infused with Lemon/Lime, similar to the Millers or Carlton Dry Range they have atm. Just confused on when to add the Lemon? Also do i use the Juice or the Rind? Some are saying boil up 4 Lemons of Rind, Strain then add the water at the start of the fermentation, others are just saying put juice and rind of 4 lemons in at start of fermentation, then theres just put in 4 lemons of rind about 3 days before bottling? HELP! What do i do?????????? by using the zest of the fruit Ã¢â‚¬â€œ start with just one in the first instance. (this also pasteurises the zest). Then strain into the brew , no need to stir.